Like the Myway Scooter, this monster of a scooter derives from Israel. Yet another scooter brand has come to the market. Its name? The Kooper Scooter, all electric monster drive, capable of top speeds of 35km/h and range of 35km! 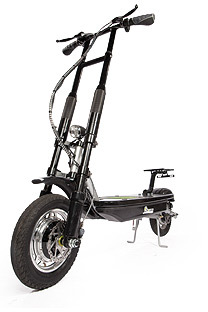 This monster of electric kick scooters sets a bar amongst all the scooter categories we know. Just like the Myway Quick scooter, it derives from Israel which signals a new freedom of personal mobility amongst the urbanites in Israel and the world. The Kooper scooter seems like the mustang of electric scooters. Its equipped with all the bells and whistles like front and rear wheel suspension, disc brakes and 2 350W hub motors for the Dooper model! Amazing! Next: Next post: Myway now officially in Singapore!